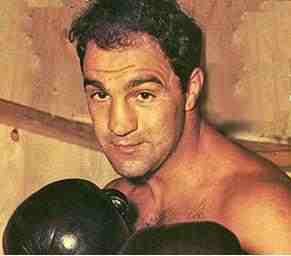 Today (1st September) is the 90th anniversary of the birth of legendary boxer Rocky Marciano (born Rocco Francis Marchegiano), who was World Heavyweight boxing champion for a 4 year period during the early to mid 1950s. Considered by many to be the greatest of them all, he was the only boxer to hold the heavyweight title going undefeated throughout his career. 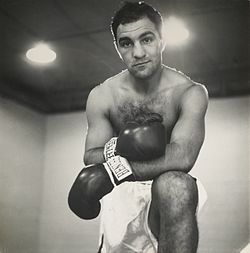 After initially winning the belt, Marciano defended the title 6 times beating the likes of Jersey Joe Walcott, Roland LaStarza, Ezzard Charles (twice), Don Cockell and Archie Moore. Bred from immigrant Italian parents in the town of Brockton, Massachusetts with 3 sisters and a brother, at the age of 18 months he almost perished when contracting pneumonia. Thankfully he survivied and his early sporting exploits at school were made up of not only playing baseball, but also showing promise as a wrestler. After serving in the US forces in the latter part of the 2nd World War (a period of this spent in Swansea, South Wales), his amateur and early professional boxing career showed great promise and at the age of 29 he went on to take the coveted World title in September 1952 when facing the 9 years his senior Walcott. At the time of the fight's conclusion Walcott was well ahead on all scorecards. However in the re-match a year later, Marciano didn't waste any time dispatching his opponent in the 1st round. 4 years after becoming the Champion however Rocky announced his retirement from the ring in April 1956 initially moving into television boxing commentary and refereeing and investing in various business ventures. In 1969 on the eve of his 46th birthday, he was killed when as a passenger in a light aircraft, the inexperienced pilot of the plane hit a tree after encountering bad weather in Iowa. With a faultless record of 49 wins, of which 43 came by way of KO, Marciano is certainly up there with the greats of the ring. Many years ago, one of my father's work colleagues used to act as an usher and doorman at the boxing presentations that regularly graced the York Hall arena in Bethnal Green (East London). He used to pass on to me many autographed fight cards by the top boxers of the day and once actually obtained an autographed photo of Marciano of which, many years later, I stupidly managed to lose!